Samsung Electronics has launched its largest B2B center in Southeast Asia as a sign of the growth prospects in the region and as a means of showcasing the innovative solutions it has for business customers. The Executive Briefing Center (EBC) and Samsung Ho Chi Minh City Research & Development Center (SHRD) are located at the Samsung Electronics HCMC CE Complex (SEHC) in Vietnam. Both facilities will contain cutting edge technology and harbor frontier thinking to ultimately boost the performance of enterprises. With a footprint of over 500m2, the center contains 12 zones displaying a range of smart solutions, which customers will be able to explore. Among those solutions are the visionary circle for smart digital displays. 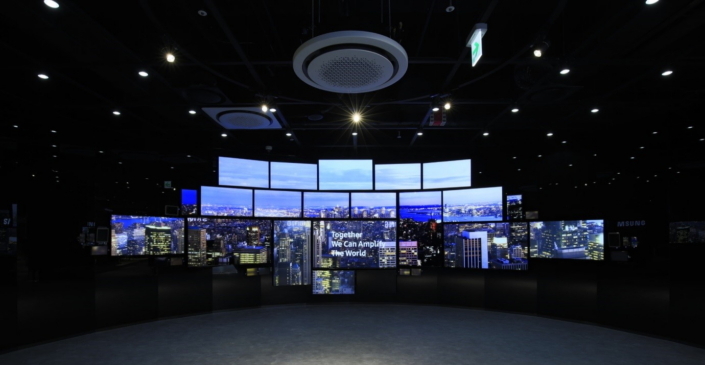 Here, a huge video wall comprised of 250 displays form the world’s largest screen to demonstrate what users can expect from Samsung’s displays products. Other key areas in the EBC include solutions for transport control rooms, fashion inventory management, automation and optimization solutions for the hospitality industry, and smart schools, offices, factories and homes. Meanwhile, the SHRD research center will be comprised of laboratories adjacent to a manufacturing area. This strategic facility will give technical and quality support in a number of ways to ensure the company can continue to innovate and develop new products. Automation, QT testing, circuits, software, modelling and 3D scanning are all on the remit of the SHRD. And with Samsung expecting to invite government agencies, business partners and local media, the new facility will be a key destination for Samsung’s B2B presence in Southeast Asia. No two regions are the same and for Southeast Asia, there are a set of drivers that are positioning Samsung’s B2B business for robust performance. Improved city infrastructure and investment in public services have helped to bring about a promising outlook for the B2B market in Southeast Asian countries such as Vietnam, Malaysia and Indonesia. Also, the growth of businesses linked to tourism such as hotels provide additional avenues for smart signage, air conditioning systems and tablets. Elsewhere in the region, in countries such as Australia, New Zealand and Singapore, it’s the digitization of everyday services and processes that is opening doors for growing B2B prospects. Supermarkets and restaurants are examples of businesses that are becoming smarter and therefore using tablets for ordering and smart signage for merchandise signboards and menu boards. The arrival of Samsung’s EBC comes at an opportune time for Southeast Asia. The market is growing and so is the opportunity for Samsung to partner with companies that have an appetite to become smarter and more sophisticated with their technology.